If you're looking for Huggies coupons to print, you're in a good place! Did you know there are many places where you can find Huggies coupons? These things pop up on the internet, in Sunday coupon inserts, at grocery stores, in magazines and even in your mailbox. The thing about Huggies coupons is you just can't get enough! As much as our little ones plow through diapers, an endless supply of Huggies coupons would be fantastic. Common Huggies coupons that we see are for $1.50/1 pack of standard diapers or $3.00 off of a bog box. Combine these manufacturer coupons with store deals and store coupons and you could rack up quite a savings. Note that you will only be allowed to print 2 of each printable coupon per computer, so feel free to run around your house and come back here on each computer to get the most prints that you can! Another place where you can score some nice Huggies coupons is Amazon.com. They occasionally will allow you to clip a digital coupon and save on your online order. A lot of times, they offer these money saving coupons at the same time as a price reduction. Being aware of this and combining these two savings opportunities can result in some pretty big savings. Buying diapers from Amazon.com is nice because it's convenient. A lot of times, you can get a better price in store using printable manufacturer coupons, but Amazon.com is very competitive, so definitely look at Amazon before you buy diapers! 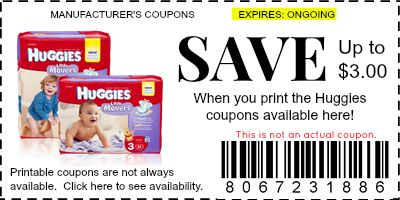 Note that generally, when you print Huggies coupons online, they will print with an expiration date 30 days from the date that you printed them. That being said, I always print them right away, because you never know when they will disappear and you're bound to find a nice sale within 30 days. If you know of any Huggies coupons that are available, please feel free to leave a comment below letting us know!